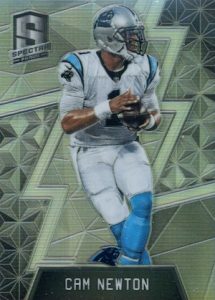 Picking up from last year, 2016 Panini Spectra Football returns with a similar format and some wild designs. Hobby boxes average 11 total hits, including four signed cards and seven relics. 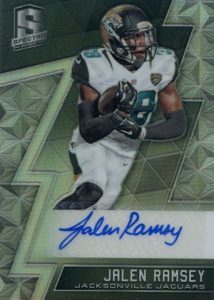 Clearly focused on the premium options, the rookie class sees considerable coverage with multiple signed cards in 2016 Panini Spectra Football. 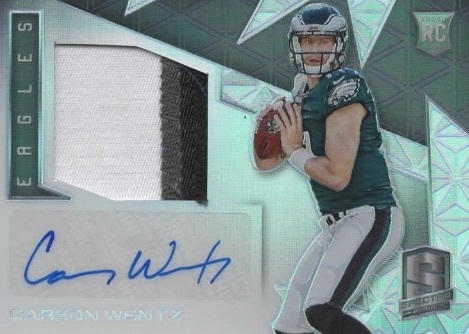 Rookie Patch Autographs (#/99 or less) feature a horizontal layout while Aspiring Patch Autographs and Radiant Rookie Patch Signatures are vertically oriented. 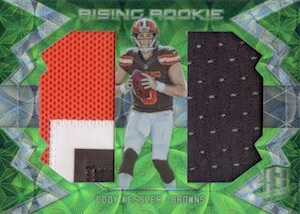 All three rookie-based inserts display an autograph and relic swatch and come in multiple one-of-one parallels, like Tags, Nike Swoosh and Team Logos. 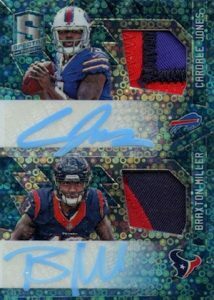 In addition, Rookie Dual Patch Autographs double up with two different first-year players on the same card and a print run of 25 or less. Numbered to just five, limited Black Light parallels offer white acrylic ink. 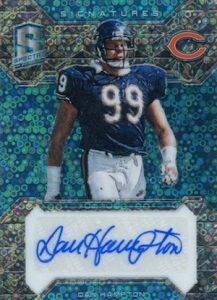 Rookies are not the only signers in 2016 Panini Spectra Football, however, as current stars and former standouts can be found in Vested Veterans and Illustrious Legends. 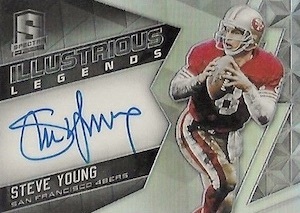 The Illustrious Legends autographs are particularly impressive given their on-card signatures for key names. 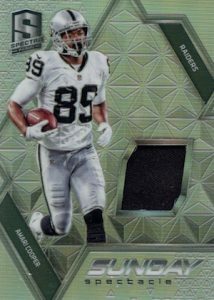 The most plentiful element of the release, 2016 Panini Spectra Football features multiple relic cards. Themes include Catalysts, Epic Legends Materials, and Rising Rookies Materials. 170 cards. Serial Numbered #/99. PARALLEL CARDS: Neon Blue #/60, Neon Blue Die-Cut #/35, Neon Green #/25, Neon Green Die-Cut #/15, Neon Pink #/10, Neon Pink Die-Cut #/5, Neon Orange #/3, Neon Orange Die-Cut 1/1, Gold 1/1. PARALLEL CARDS: Neon Blue #/60, Neon Green #/25, Neon Pink #/10, Neon Black Light #/5, Neon Orange #/3, Gold 1/1, Gold Laundry Tags 1/1*. *GOLD LAUNDRY TAGS: NFL Player's Logo 1/1, NFL Shield 1/1, Nike Swoosh 1/1. PARALLEL CARDS: Neon Blue #/99, Neon Green #/25, Neon Pink #/10, Neon Orange #/5, Gold 1/1. 48 cards. *Cards #39, 48 only found in certain parallels. 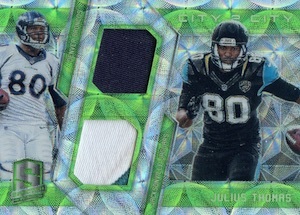 PARALLEL CARDS: Neon Blue #/50 or less, Neon Green #/25 or less, Neon Pink #/10 or #/5, Neon Orange #/3, Gold 1/1. PARALLEL CARDS: Neon Blue #/60 or less, Neon Green #/25 or #/15, Neon Pink #/10, Neon Black Light #/5, Neon Orange #/3, Gold 1/1, Gold Laundry Tags 1/1*. 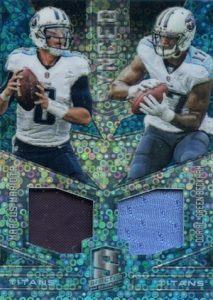 GOLD LAUNDRY TAGS: NFL Player's Logo 1/1, NFL Shield 1/1, Nike Swoosh 1/1. PARALLEL CARDS: Neon Blue #/99 or less*, Neon Green #/25 or less*, Neon Pink #/10 or #/5*, Neon Orange #/3, Gold 1/1. All subjects not included in Blue/Green/Pink parallels. View specific options with the full spreadsheet. 24 cards. *Card #1 found only in some parallels. PARALLEL CARDS: Neon Blue #/99 or less, Neon Green #/25 or less, Neon Pink #/10 or #/5, Neon Orange #/3, Gold Laundry Tags 1/1, Gold 1/1. PARALLEL CARDS: Neon Blue #/60 or less, Neon Green #/25 or #/10, Neon Pink #/10 or #/5, Neon Orange #/3, Gold 1/1. PARALLEL CARDS: Neon Blue #/50, Neon Green #/25, Neon Pink #/10, Neon Orange #/3, Gold 1/1. PARALLEL CARDS: Neon Blue #/99 or less, Neon Green #/25 or #/10, Neon Pink #10 or #/5, Neon Orange #/3, Gold Laundry Tags 1/1 (no card #4), Gold 1/1. PARALLEL CARDS: Neon Blue #/99 or less, Neon Green #/25, Neon Pink #/10, Neon Orange #/3, Gold Nike Brand Logo 1/1, Gold 1/1, Gold Laundry Tags 1/1*. 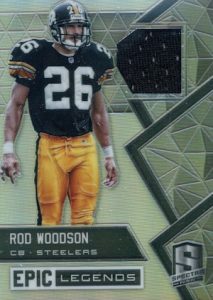 *GOLD LAUNDRY TAGS: Tags 1/1, NFL Shield 1/1, Nike Swoosh 1/1. PARALLEL CARDS: Neon Blue #/99, Neon Green #/25, Neon Pink #/10, Neon Orange #/3, Gold 1/1. PARALLEL CARDS: Neon Blue #/60 or less, Neon Green #/25 or #/15, Neon Pink #/10, Neon Orange #/3, Neon Black Light #/5, Gold 1/1, Gold Laundry Tags 1/1*. *Card #12 not included in Neon parallels. PARALLEL CARDS: Neon Blue #/99, Neon Green #25, Neon Pink #/10, Neon Orange #/3, Gold 1/1, Gold Laundry Tags 1/1*. PARALLEL CARDS: Neon Blue #/99 or less, Neon Green #/25 or #/10, Neon Pink #/10 or #/5, Neon Orange #/3, Gold 1/1. PARALLEL CARDS: Neon Blue #/15, Neon Green #/10, Neon Pink #/5, Neon Orange #/2, Neon Black Light #/3, Gold 1/1, Gold Laundry Tags 1/1*. PARALLEL CARDS: Neon Blue #/99 or less, Neon Green #/25 or #/10, Neon Pink #/10 or #/5, Neon Orange #/3, Gold Laundry Tags 1/1, Gold 1/1. PARALLEL CARDS: Neon Blue #/99 or less, Neon Green #25 or less, Neon Pink #/10 or less, Neon Orange #/3, Gold 1/1, Gold Laundry Tags 1/1*. PARALLEL CARDS: Neon Blue #/50 or less, Neon Green #/25 or #/15, Neon Pink #/10 or less, Neon Orange #/3, Gold 1/1. 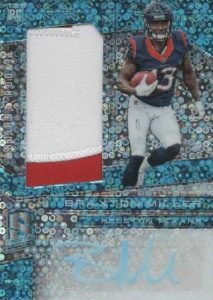 Looks like a cool product but why oh why would you make a card of Wes Weller in a Rams jersey??? He played for that franchise for about 10 minutes. Seema like a waste of 25 good stickers. Another stunning issue of Spectra! There are 2 things that are a bit bothersome: 1. 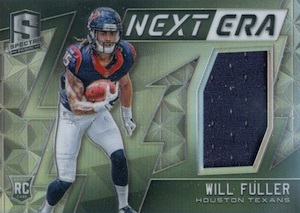 Although there are 11 “hits” per box (4 autos & 7 other relics/patches/tags, etc. ), there are just too many single color, high serial #/d of the relics. I even noticed a couple of pretty low numbered relics that are one color, a growing problem across all brands for me. 2. The previous Spectra issues were pretty much a solid, single color. They were stunning, bold, and shiny (like a kitty, small child or maturity challenged adult, I’m drawn to shiny things). The new issue design is very busy…tiny bubbles (Don Ho approves), and a real mixture of other things. But, I still love Spectra. 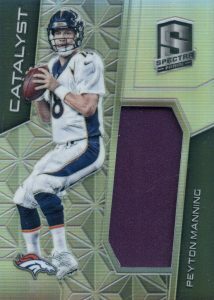 And after all, for a card mercenary like me, it’s all about the big hits and Spectra certainly offers the potential for those. $275 a box? Uh…not quite. Do a group break first. P.S. I love those whacked out Die-cuts! 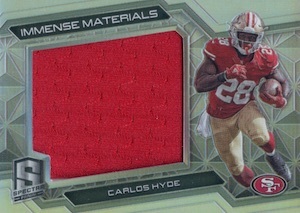 Oh my God I miss Topps, this stuff, and all Panini products are far less quality and appeal. It’s brought to make you stop collecting. Love this product this year, good mix of rookies, veterans and Legends.